In the city that never sleeps, the sounds of the city never cease either. The cacophony of cars, people, and bustling business constantly bombard the citizens of New York. Yet underneath all of the abrasive noises, local artists bring music to New Yorkers' ears for a brief moment as commuters pass by them in a maze of underground tunnels. These subway artists, bold enough to perform by themselves for hours on end for a fleeting crowd that generally has no interest in hearing them, contribute greatly to the everyday NYC experience. Yet they perform at arguably the worst and most thankless venue that Manhattan has to offer, and at most, they receive pocket change in acknowledgement for their musical talents and passions -- until now. Enter Pirate Radio and their From the Subway to the Stage concept. Composed of Karan Mehra on decks and Brian Taylor on guitar, keyboard, and theremin, Pirate Radio will seek to embrace these subway artists in their new project. They will look to combine these musicians' solo skills with Mehra's electronic beats and Taylor's live guitar to create both a captivating sound and a unique live music experience. The duo will pull one music act that catches their attention on their commute through the city -- anyone from an accordion player, to a classically trained violinist, to four seventy-somethings playing the sax -- and invite them to perform with them for their monthly gig at Pianos in the Lower East Side in Manhattan. From the Subway to the Stage officially kicks off this Friday and will feature its first subway musician: saxophonist Paul-Alexandre Muerens. The concert series is the new core concept in Pirate Radio's Jams of New York series, a regular performance at Pianos on the first Friday of every month and a standout amongst the countless events in NYC. The duo will try to incorporate a different instrument every month in their four hour-long set, with Pirate Radio on stage the entire time and their guest musician performing on and off. In featuring subway artists in their monthly sets, Karan and Brian hope to use Jams of New York to give back to the local music scene by making these musicians heard and appreciated for their talents. The unusual nature of their music and Pianos' continually changing weekly crowd presents Pirate Radio with the challenge of having to adapt the sound of their sets based off of the people in the house that night. As a consequence, their sets feed off of the crowd's vibes and energy, making their live music remarkably personal and engaging for their audiences. The series follows Pirate Radio's desire to actively involve the people of New York in their music. Their musical partnership began in 2010 when Mehra and Taylor moved to New York for a job in software development. Shortly after meeting, they discovered each others' passion for music. The two clicked immediately and they started a very informal jam group to play around on guitar together after work. When Mehra started playing with his older brother's turntables, he was hooked immediately and the foundation for Pirate Radio was born. They continued to jam together and frequently invited their friends to play with them in their apartment. "The spirit was always about the jams and getting more people involved," explains Mehra. "It didn't really matter whether we sounded good or not, just getting as many people involved as we could to make music." Eventually, they began to play at house parties for their friends, until one of their friends encouraged them to take their jams out into the public and offered to help them book their first gig, sparking the duo's rapid and exponential success. Since Pirate Radio's official formation in December 2012, they have consistently performed live more than once a month at ten different venues in New York City. In 2013, Pirate Radio opened for three of the most loved and respected names in trance music: Mark Eteson (Anjunabeats, Garuda), Jorn Van Deynhoven (Armada), and Matt Lange (Anjunadeep). They played for their biggest crowds yet in their first international tour in India in the beginning of this year, and upon their return, they opened for Nic Chagall of the legendary Cosmic Gate. 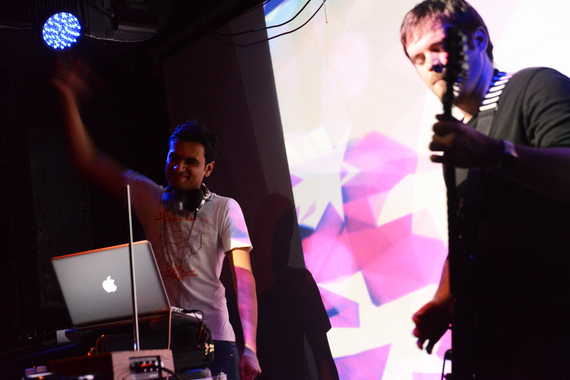 Shortly thereafter they landed their first ever residency at Pianos, where they perform on the first Friday of every month, and followed that with their biggest club gig to date where they opened for trance legend John O'Callaghan. In addition to their Jams of New York series, Pirate Radio's discography includes tracks from different subgenres of house and trance, all intertwined with Taylor's live guitar riffs, solos, and effects. From their slapping grooves in "The Funk, Soul, Brother" to Taylor's brilliant improvised solos in their four hour Pink Floyd tribute set, these musicians have mastered the art of incorporating live music elements within a traditional EDM set. Pirate Radio will undoubtedly utilize this mastery in their show this Friday to seamlessly combine the unheard talents of New York's subway musicians with their own infectious sounds, giving their audience a unique and unforgettable concert experience. This article is by Alexandra Wuerfel, Party Earth writer.